'Captain Marvel' Adds 'She's Gotta Have It' Star DeWanda Wise...Hopefully As Spectrum? I believe my dream of seeing Monica Rambeau, aka Pulsar, aka Photon, aka Spectrum, and aka the black Captain Marvel, on the big screen is one step closer to reality. Deadline reports that DeWanda Wise, star of Spike Lee's She's Gotta Have It series on Netflix, has joined the cast of Captain Marvel. 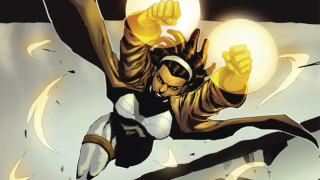 Is it confirmed Wise is playing Monica Rambeau? Not yet, but just you wait. Rambeau not only has shared the powers of Carol Danvers, who I played by Brie Larson in the Marvel film, but they are also really close friends. It makes sense that Rambeau would be in the story somewhere. I'll be honest, I always wanted Teyonah Parris to play her but Wise is a pretty damn good choice, too. Wise joins Larson, Samuel L. Jackson, and Ben Mendelsohn in the film directed by Ryan Fleck and Anna Boden. It will be set in the '90s and reportedly has the alien Skrulls as the primary villains. Captain Marvel opens March 8th 2019.